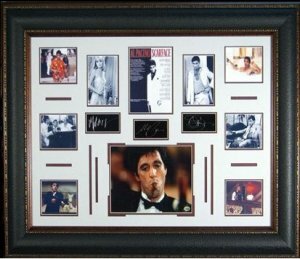 Scarface custom premium framed unautographed Signature Engraved oversize 27x39 piece. FEATURING THE ENGRAVED SIGNATURES OF Michelle Pfeiffer, Al Pacino, and Steven Bower.. FRAMED AS SHOWN TO AN OVER-ALL SIZE OF 27"X39"